Operation Rescue has obtained an incident report from the Boston Police Department that sheds a bit more light on a medical emergency last month that caused six police and fire vehicles to swarm the Planned Parenthood abortion facility there. 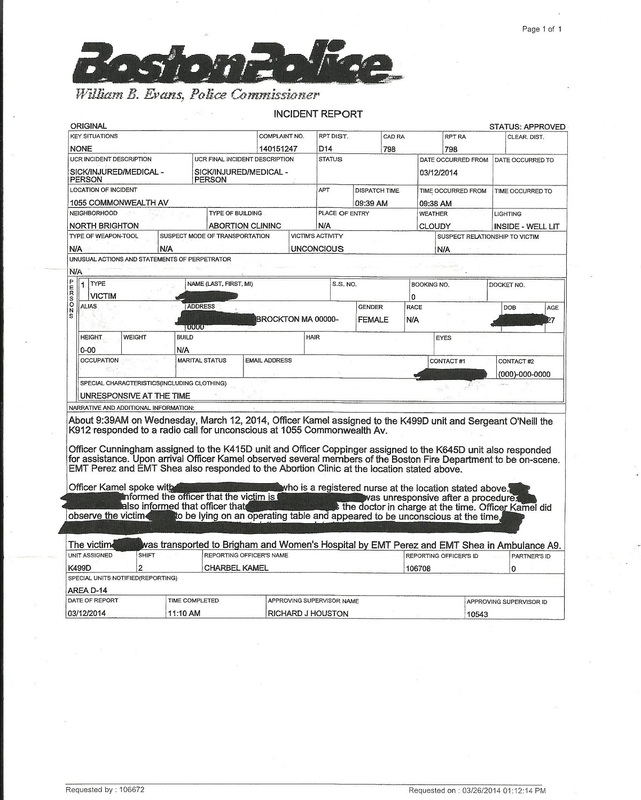 According to the police report, a 911 call was placed at 9:38 a.m. on the morning of March 12, 2014, indicating that a woman was unconscious. A police officer heard the call over his radio and responded to assist. When the officer arrived, he observed several members of the Boston Fire Department already on the scene. The woman was transported to Brigham and Women’s hospital by ambulance and the report was completed at 11:10 a.m., nearly an hour and a half after the 911 call was first placed. There was no further information about the woman’s condition provided on the report. It is now clear that the reaction was not reported until after the abortion was complete. Operation Rescue is calling on the Massachusetts Board of Registration in Medicine and the State Department of Public Health to fully investigate this incident. Operation Rescue has documented at least three previous medical emergencies at this same Planned Parenthood abortion facility in Boston that required emergency transport to local hospitals. Those incidents occurred on September 5, 2012, July 7, 2012, and January 7, 2011, establishing a troubling pattern of behavior that warrants further investigation.